Today’s interview on open culture is with Cathie Oats, Director of Trove, the National Library of Australia. 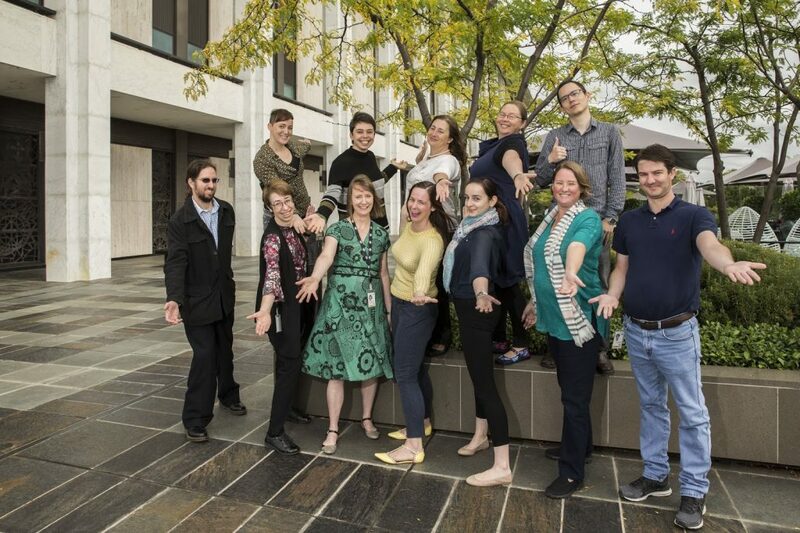 Front row: Mark Raadgever, Cathie Oats, Hilary Berthon, Julia Hickie, Cheney Brew, Mel Hunt, Chris McPartland. Back row: Kate Newbown, Samantha Vilkins, Anya Dettman, Catriona Bryce, Tyler Chan. There’s a change in perspective that’s been brought about by the internet. A large and engaged group of researchers and citizen researchers are making new discoveries and building new digital tools. This has been made possible because of online access to authoritative sources, to wonderful cultural material, and this is because of the work that’s being done to in the cultural and research sector. Museums, galleries, archives, libraries and research institutions have provided a new level of access. You can go anywhere by sitting at your desk. The internet has made that possible. That level of access to cultural information is why I get out of bed every morning. Not only do I get to think about the most beautiful objects in the world all the time, I get to think about how people would like to find out about them and how they’d like to engage with them and actually use them themselves. Everyone. It’s not only about people who benefit right now but who is going to benefit in 20, 30 or even 40 years’ time. I think that’s the interesting question around benefit. What we do with cultural material, specifically in relation to digitisation, is sometimes about saving and preserving items that we could lose. I’m thinking specifically about indigenous languages. That’s on my mind the week of this interview as it’s Naidoc (National Aborigines and Islanders Day Observance Committee) week in Australia. It’s an opportunity to preserve the recordings of some languages and words that would otherwise be lost. It’s a lifeline that will allow people to learn these languages in the future because the recordings have been preserved and, if appropriate, made openly available. That combination of preservation and the ability to access material anywhere is really an advantage. You’ve got the combination of rare items, and an audience who might not usually be able to get to them – all those barriers are taken down when we take an open culture approach. Tell us about a successful project using open culture resources? Amongst Trove’s collections, there was a photo of a hand carved from whalebone and held together with catgut pulleys, it was made in 1845. 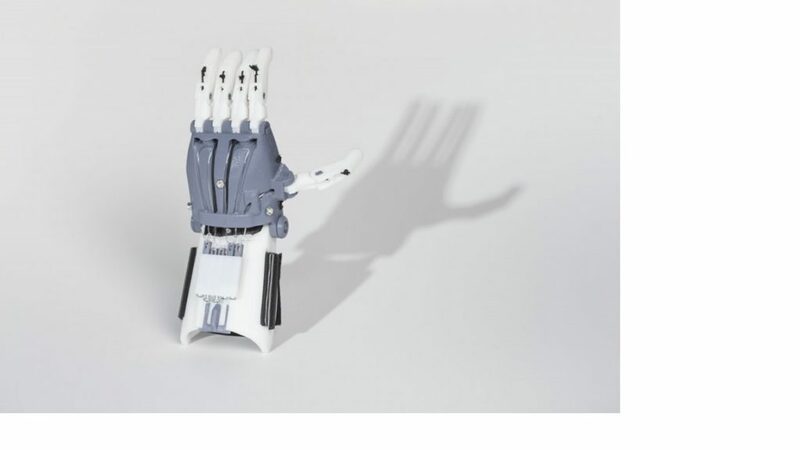 Someone in the US found it in Trove and used it in his design for a 3D-printed prosthetic hand that people are now actually making because the designs are open source. We would never have imagined that would happen when the South Australian Museum of Health put that image into Trove. But it has. Trove and Questacon’s version of The Raptor. For a reason slightly beyond what people usually say. It’s about making connections between people who previously could not be connected. If the item’s behind a table, there’s a barrier between you and it and those connections are much much harder. The opportunity to tell the story with new details is impossible. It’s important for these resources to be freely available so people can make new connections and new discoveries. A good example of this is the video we were able to make telling the story of one Australian woman, Jessie Webb, using open, out-of-copyright material from Trove. Using digitized newspapers, and research from books, diaries and photos, our team learnt about Jessie’s life and were able to tell her story, illustrating it using our collections. We filled in extra facts using information sourced from a state library, a university archive and a museum collection from different parts of the country. These connections are possible because of open culture. If there was no barrier to anything, I would think about people currently alive – authors, artists – and the risk open culture poses to them. It’s really important that creators have viable paths to take, to make up for anything they may be losing because their works are freely available. So I want to answer that question with that acknowledgement. Open culture shouldn’t mean the creator is disadvantaged. The future is very much I think where the curation activities, traditionally in the hands of institutions, are starting to move more closely to the audience. People are creating and engaging with content in a way that we haven’t imagined. The more that is digitized, the more we are going to be able to make discoveries we had no idea would be possible. I have to be careful not to have a busman’s holiday here! I’m a massive fan of anything that’s digitized books or manuscripts. These are the things that fascinate me. When they’re online and they’ve been digitized, I can see more in them than when they’re behind glass. That’s a true delight. That’s why I like to access them, they’re beautiful. One of my favourite pieces is the Living Archive of Aboriginal Languages. It’s pretty fabulous. It’s a digital archive of endangered literature in Australian Indigenous languages of the Northern Territory. You can explore languages through a map, find language groups and see books and hear reporting in indigenous languages. It’s quite extraordinary. That’s really important, it’s back to that idea of seeing things that are valuable in a new way. I selected this site because this interview was conducted during NAIDOC Week, when celebrations are held across Australia to celebrate the history, culture and achievements of Aboriginal and Torres Strait Islander peoples. NAIDOC is celebrated not only in indigenous communities, but by Australians from all walks of life.